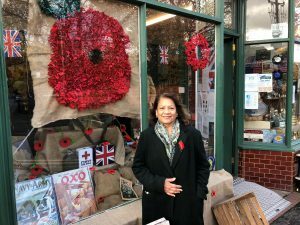 I attended the Remembrance Sunday Services on Sunday 11 November 2018 in Walsall Town Centre and in Darlaston and laid a wreath at each service. After the procession to the Cenotaph, there were prayers and hymns led by the Right Reverend Bishop of Wolverhampton Clive Gregory. The sounding of The Last Post by a Bugler rang out at 11am before the 2 minutes silence was observed. The Reverend Mark Kinder from the Crossing at St Paul’s presided over the proceedings at the Town Centre. After the Remembrance at the Town Centre I went to Darlaston and processed with the congregation of St Lawrence’s to the Cenotaph at Darlaston. The Reverend Andrew Lythall led the proceedings. I am pictured below outside the Mindful Gifts shop. There were other displays around the Town Centre commemorating 100 years for the end of the First World War.